“What is a Missouri artist doing painting images of beaches, boats and many things tropical?” Many people ask her that question right after saying “I love your color” as they look at her colorful oils, acrylics, and watercolors. They may see a large boat harbor full of colorful boats with reflections, a small intimate painting of a fisherman's boat or an inviting beach full of sparkling colorful water. A look at the life of Terri Myer will help explain her ambitions and goals and answer why she paints these subjects. Terri was introduced to the wonders of water, fun in the sun, and boats at an early age. Shortly after being born in Laurel, Maryland, her family moved to Missouri. At age three her parents bought a small motor, rented a boat, and spent weekends fishing or just riding leisurely around lakes near their home. Proof of her love of boating is evident in photos from that time. When Terri was seven, her parents bought a bigger boat with a bigger motor – big enough to ski behind. The next 12 years would be filled with wonderful weekends skiing and boating on Missouri lakes. Terri's passion for doing art, like her love of sun and water, came very early. She is reminded of this by her mother who says when she was three years old she drew all over her walls ... and then had to clean them off – oops! The family had just moved into a new rental house where Terri had her own room for the first time. All those white walls must have been too enticing for a newly developing artist! In grade school, Terri created her own board games to play, designing both board and game pieces. She also wrote and illustrated little story books. In 5th grade, her teacher noticed her passion for art as he singled her out and let her have whole afternoons drawing murals on butcher paper mounted around the classroom. All she had to do was finish all her regular class work first. During junior high, Terri painted her first oil paintings. At the end of junior high school, the family took a trip to Florida. There, Terri saw a beach with palm trees and crashing waves for the first time. The energy, expanse and beauty of the sea enthralled her. The movement and sparkle and shine of the colors of the ocean stayed with her. She saw the fishing boats, especially the shrimp boats, with their tall masts and booms and sea-worn look and color, as majestic. Compared to the cabin cruisers and ski boats in the lakes back home, their unique character and life was intriguing. These were real boats, boats that were used for work, boats that went out to sea. It was an experience she would never forget. Terri continued with art classes every year in high school. One oil painting was an ambitious 3' x 4' work of a mansion with a stream in front. After high school, Terri entered the University of Missouri-Columbia as a music and art major. Her artwork was chosen for the university's annual student art show both years she was there. During the fall semester of Terri's second year, something happened to change her life. She was nearing completion of a 4' x 4' surrealistic oil painting of swarming bugs on a red bubbling flying planet. Each insect was realistically painted from her own bug collection. She spent weeks on it – even working on weekends. The painting was stolen the day it was due. There was no problem about the grade in class for everyone knew of the painting; but Terri was completely devastated. She quit college after that year. Terri married later that year and moved with her husband to Cherry Point, North Carolina. After the bad experience at the university, she was in for a real treat in her new home. The coast of North Carolina was sunny, warm and full of wonderful beaches, sparkling water and boats. Ah-h-h-h-h! She drew the boats (in ink at first, then watercolor). Then, after being awarded “Best of Show” at the local Havelock 9th Annual Spring Show in 1978, Terri was hired by the local newspaper as its Layout Artist. Her newspaper responsibilities could be accomplished in three days giving her four-day weekends to draw and paint. And guess what? There was a little beach gallery called “Laughing Gull Gallery” where she sold her art. What fun! After four years in North Carolina, Terri, her husband and first son, moved across the country to Springfield, Oregon. During her eight years in Oregon, Terri graduated from the University of Oregon with a BS degree in Fine Arts and Art Education; she painted and participated in art shows; Lutheran home commissioned her to paint a series of paintings; and Terri was an active member of the Emerald Empire Art Association. She exhibited her paintings and drawings in the association’s gallery, and she gave presentations to the membership. One year, she won a free membership in the association by designing its new brochure. Life was getting busy with all these activities, full-time school and, now, three sons. Then life threw another curve. Terri and her three sons moved back to Missouri following a divorce. The next years were a struggle as Terri began her 24-year career of teaching art to students K-12 balanced with her other full-time job of being a single Mom. With a lot of planning, she was able to take her three sons on two trips to the east coast. After all, she believed it was very important for them to experience the incredible beauty and wonder of the coastline. As Terri's sons grew older and more independent, and her teaching seemed more manageable, she was able to go back to college. She graduated from Lindenwood University in St. Charles, Missouri, with an MA in drawing and painting. Then she continued on to achieve an important lifetime goal - an MFA in painting in 2005. Each degree included one-man shows. Her first show, and master's thesis, focused on plein aire painting in watercolor. The second show, still watercolors, was more focused on color, boats and water. The subject matter for these shows was based on trips to the coast of North Carolina, Florida and the rivers and lakes of Missouri. In 2006 Terri and her fiancé Mark went to Jamaica for spring break. They were married on a beautiful, white-sand beach. It was like a storybook wedding. Then, their first anniversary was a trip to Italy including Venice, land of boats and water, which became the subject of many paintings to follow. They also traveled to Costa Rica where they stayed in a resort built near the canals. While there, Terri hired a native of Costa Rica to boat them around to remote areas of the canals. She took lots of pictures for future paintings. Terri continued to participate in shows and exhibits, especially with the St. Louis Watercolor Society. She also began exhibiting in more juried events. But, there wasn't a lot of time for shows along with full-time teaching. It made her want to do her own work more and more. 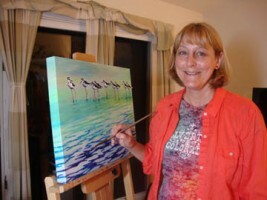 Finally, in June of 2011, Terri retired from teaching to pursue her art full time. Years of watching students do art resulted in an explosion of her own art. She experimented with watercolor on canvas, watercolor collage, acrylic painting and, what she started out with years ago, oils. Years of teaching the elements and principles of art had an influence on Terri's work. They reinforced in her the importance of the fundamentals of art. She looks for unique perspectives in her images. Many of her subjects include multiples of similar shapes creating movement and rhythm in the painting. One type of repetition involves the movement of water and reflections that recur in her paintings. Recently, Terri has painted on canvases that have a 1.5” profile. She paints the image all the way around the edges. She believes this gives her work a more contemporary as well as consistent appearance. Painting around the edges can be a bit challenging depending on the details wrapping around. Each of Terri's paintings has a personal story attached. In April, 2012, Terri and her husband traveled to the island of Curacao in the Caribbean. Many of her paintings from 2012 to 2013 are based on the images and culture of this beautiful island. Boats and buildings are painted in bright colors. It would have been nice to paint on site there; but, with only one week, Terri had to rely on taking hundreds of photos and videos to work from later in the studio back home. Color is Terri's number one concern. She chooses subjects based on their colorful possibilities. She believes color can evoke joy and happiness by those who view and collect her work. To get the results she wants, Terri employs a variety of techniques. Blending or mixing colors, layering, or sometimes color straight out of the tube, gives varying effects. Placement of colors and the amount of any one color in a single painting are also very important considerations. Terri uses quality oil paints and finishes her work with a protective varnish to insure the colors will last. Terri and her husband now live on a small lake in Fenton, Missouri, and have a small dock and paddle boat. Her art studio overlooks the lake. As she gazes down at the lake, she imagines the fantastic subjects of her travels and tries to bring back visual memories as she paints. Her photos help her visualize the colors, sounds and other sensations of the locations. In the meantime, she is planning her next trip to the coast for a new dose of beaches, boats and colorful reflections.